I was looking for something fun to do on Table. North ridge looked good. Then I found out there's a trail. Boo! Oh well, with enough snow it might feel adventurous, so off I went. There was more snow than I expected, more than last weekend at Greenleaf. It's been a bit warm, but I recall it was chilly around Wednesday, so that's probably when it picked up a few inches. After a demoralizing long steep rainy posthole trudge up a viewless powerline road, I arrived at the saddle on the north ridge of Table Mountain. Sign said 1.4 miles on the trail to Table. Took two hours of postholing and bushwhacking in miserable weather to cover that distance. 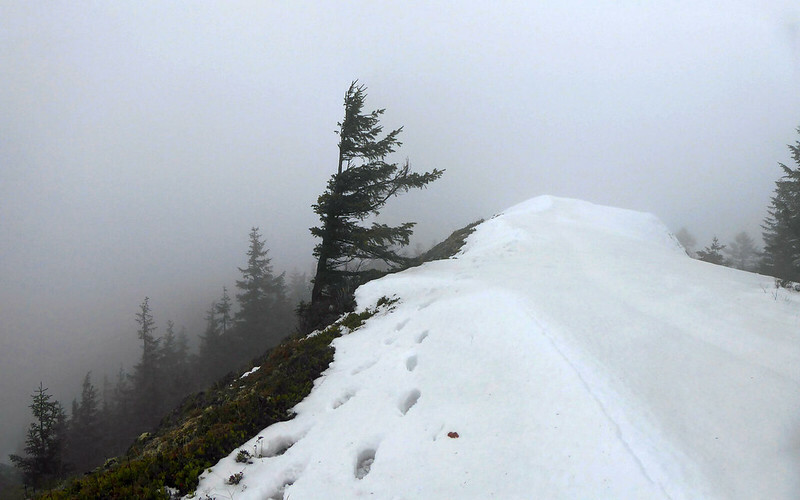 Just a little ways up the trail, I grew weary of the sloppy wet snowy blowdown. I turned around and backtracked down the trail a bit until I found a good spot to access the ridgecrest, hoping it would be less brushy. It was totally open, and a bit wind scoured for less snow depth. As I ascended, the clearings yielded to brush, but never as thick as it was down on the trail. Hit a high point and dropped to a saddle where I found the trail. It started to get a little more interesting: steep, cliffy, less brush. I'd been worried that my ridge might just fade into the plateau, but it didn't. When I topped out, I stayed right/west for better scenery (less trees). By the time I reached the top of the SW ridge, the clouds were opening up a bit, and I could actually see into the gorge. Not the classic Table Mountain views, but I liked the atmosphere, very moody. But within a few minutes I was back in pea soup again, and the rain returned. I headed back, but before dropping off the north ridge I decided to poke around the plateau a bit. Occasionally saw signs of the loop trail, but couldn't follow it. Happened to stumble into the table, which was a high point of the day. Hadn't seen it yet, and it was on my to-do list for this hike. I had pretty much abandoned hope of finding it, due to weather and snow, and the fact that I didn't even know where to look. Took a bit of a break here, but soon realized I was possibly in danger of hypothermia. Not terribly cold, but it was windy and I was wet. So I hustled on back, fast enough to generate some heat. At the saddle where I had encountered the trail on my ascent, I eschewed my route up and over the hump, and decided to try the trail instead. Very hard to follow, but I persisted, until I gave up and veered left/west/uphill, knowing I'd eventually hit the ridgecrest and my footprints. Retraced my steps down the ridge, yadda yadda, back to the truck, wet and miserable, but glad I did it. Disregard "Greenleaf Basin". It's to the east, below the far side of the ridge. Trail starts where the powerline clearing crosses the ridge at the saddle. The PCT runs roughly parallel to the ridge on the west side (so it's down there in the forest in this pic) and ascends almost to the saddle. I wasn't going to deal with that impediment on the ridgecrest. Not today. Looking back at my west-side traverse. Chip Down wrote: Then I found out there's a trail. Boo! Oh well, with enough snow it might feel adventurous, so off I went. Nice hike, and beer! 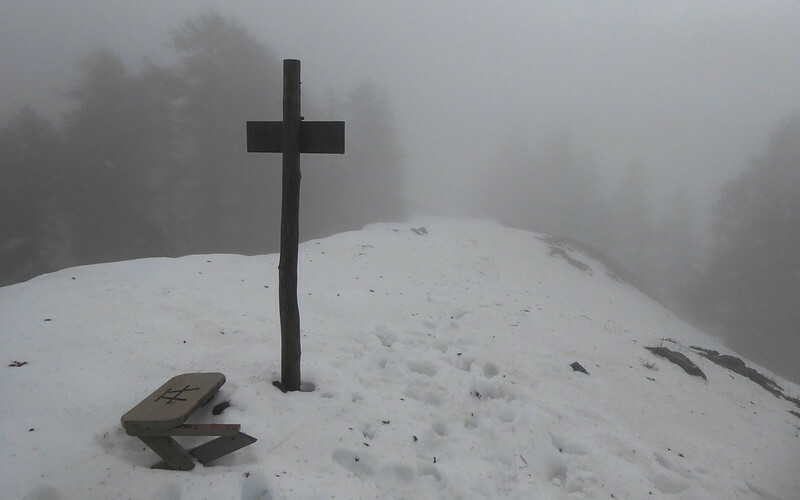 Even More Jesus is my sort of standard winter hike drink. I mean, you know, apart from water. Nice! You really upped the ante for what for what some of us call a "Looney Hike". There isn't really a trail on the west side or atop that north half of the ridge between the power lines and Table but as you noted, it's better than the old road grade. BTW, the first half of the road grade was actually a rail spur that was in operation from about 1919 to 1929. Hard to believe that rails were clear up there but parts of the old steam engine that pulled the cars and equipment up and down the hill are near there. The main cable is still there, too. Haha! I wondered whose footprints those were!!! Shot at 12:35... It was nice to have those tracks to follow, at this point. Two sets of prints on north summit. Met the gal that had made one of them. Sure wondered about who'd made the prints on north exit, though! She was going down Westway. I guess you beat me to here, as well. Heh... So close! Saw absolutely no need to go visit the south-facing viewpoint, myself! I didn't hardly pause at this point, also being very concerned about the coldness that had totally taken me over. Despite it being 38°, I was pretty soaked and really needed to descend. Ah, the illusion of solitude. It was so easy for me to assume I was the only one up there. Glad I at least had virgin snow. It would have been so disappointing to arrive later to find footprints. Although, from looking at your other pics, it looks like we both would have been better off starting the day a little later. This might sound really weird and neurotic, but I feel a little self conscious about my footprints, as if somebody might look at them and think "wait...he went there, and then there...that doesn't make sense...and what's with that little weird indecision there...what an idiot...maybe he's been drinking". Anyway, really glad you posted. I love near-miss stories, and even posted one myself when I just missed Pablo in a weird off-the-beaten-track spot and wondered who was crazy enough to be there. I hit the Table plateau just before 11:00 I think, and spent nearly an hour up there. Glad to see you too found the weather around the table-on-Table junction to be unbearable. I'd feel bad if you said "what's the big deal, I rolled out my blanket and had a delightful picnic". It wasn't the temperature, it wasn't the wind, it wasn't the rain, it was all three that made it awful. Don, thanks for that info. I assumed my difficulty on the "trail" was seasonal (recent storm damage) but it sounds like it's never all that great. On my image below, note the road the leaves the saddle junction and follows the west side of the ridge. From your post, I gather that's a dead end. There is some saw-cut maintenance, but it got brushy fast, so I didn't bother exploring. I was curious about the switchbacks in the black box (map below) but never spotted them. My suspicion is that even w/o snow, that road is too overgrown to be worth following, except maybe for artifact hunting. As a reference, the yellow dots show what I believe must be the "trail" as it bypasses the hump. Chip Down wrote: Don, thanks for that info. I assumed my difficulty on the "trail" was seasonal (recent storm damage) but it sounds like it's never all that great. On my image below, note the road the leaves the saddle junction and follows the west side of the ridge. From your post, I gather that's a dead end. There is some saw-cut maintenance, but it got brushy fast, so I didn't bother exploring. I was curious about the switchbacks in the black box (map below) but never spotted them. My suspicion is that even w/o snow, that road is too overgrown to be worth following, except maybe for artifact hunting. As a reference, the yellow dots show what I believe must be the "trail" as it bypasses the hump. Yes, that road dead ends in 1/2 miles from the power lines. Your yellow dots follow the route. From there, a pretty decent trail continues to Table. I think the second quarter mile of the road was made when salvage logging started in 1938. The switchbacks were probably made at the same time to facilitate removal of what good timber remained after the fire of Sept. 1929. I've explored all those switchbacks and found nothing of interest and their steepness tells me they were made with a cat, not with steam-era equipment. That first 1/2 miles of road/trail was once kept fairly open by the ATV crowd but they haven't seemed interested in it for about the past ten years or so. Being in the lee of the ridge, it accumulates a lot of snow and that snow weighs down the slide alder making it a real problem to navigate. Here's a photo taken from the summit of Greenleaf Peak shortly after the fire of '29. The saddle with the power line road is left of center. You can see that there is quite a bit of unburned timber on the east side of the ridge. The second photo abuts the first with Table on the left. Lots to explore up there! Haha now I know what all those tracks I saw were about. Crazy person # 4 here. I went up to Greenleaf via the PCT. 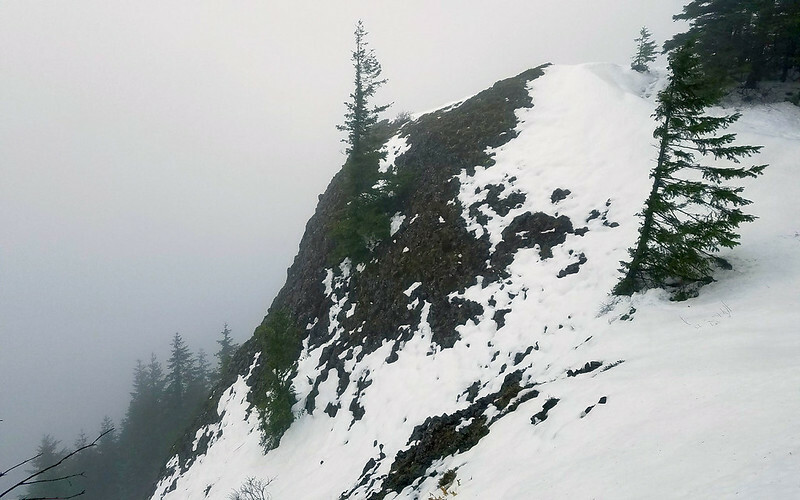 Chose not to go over Table since I have gone over the North Ridge before and figured it might be an interesting down climb, if I went up Heartbreak Ridge and over Table, then down the North Ridge. Where the roads intersect just past the North Ridge Trail, I took the middle road and saw tracks on the upper, lower, and towards the North Ridge Trail. Wondered if my ultra runner friend was out training for his next big race, bagging Table, North and South Birkenfeld, and Greenleaf because he does that sort of thing a lot. Basically went from there, climbed Greenleaf, wondered why the tracks stopped before it, then went back the same way. About 25 miles total.